The cell is the smallest living organism that contains all the features of life, and most all life on the planet begins as a single-cell organism. Two types of single-celled organisms currently exist: prokaryotes and eukaryotes, those without a separately defined nucleus and those with a nucleus protected by a cellular membrane. Scientists posit that prokaryotes are the oldest form of life, first appearing about 3.8 million years, while eukaryotes showed up about 2.7 billion years ago. The taxonomy of single celled organisms falls into one of the three major life domains: eukaryotes, bacteria and archaea. Biologists classify all living organisms into the three domains of life starting with single-cell to multicellular organisms: archaea, bacteria and eukaryotes. A plasma membrane that protects and separates the living cell from the external environment while still allowing the flow of molecules across its surface, in addition to specific receptors within the cell that can affect cell events. An internal area that houses DNA. Except for bacteria, all living cells contain membrane-separated compartments, particles and strands bathed in an almost liquid-like substance. Prior to 1969, biologists classified cellular life into two kingdoms: plants and animals. After 1969 to 1990, scientists agreed upon a system of classification of five kingdoms which included monera (bacteria), protists, plants, fungi and animals. But Dr. Carl Woese (1928-2012), formerly a professor in the Department of Microbiology at the University of Illinois, proposed a new structure for classification of single celled organisms and multicellular entities in 1990 to consist of three domains, archaea, bacteria and eukaryotes, subclassified into six kingdoms. Most scientists now use this taxonomy or system of classification. Archaea thrive in extreme environments, previously thought unsustainable to life: deep sea hydrothermal vents, hot springs, the Dead Sea, salt evaporation ponds and acid lakes. Prior to Dr. Woese's proposal, scientists first identified archaea as archaebacteria – ancient single cell bacteria – because they looked like prokaryotic bacteria, single celled organisms that lack a separate membrane-bound nucleus or organelles. Further studies by Dr. Woese, his colleagues and other scientists led them to realize that these ancient bacteria were more closely linked to eukaryotes because of the biochemical features they exhibit. Scientists and researchers have also discovered archaea living in the human digestive tract and skin. They are prokaryotic cells, but are genetically more like eukaryotes. Cellular membranes consist of branched hydrocarbon chains, unlike bacteria and eukarya, connected to glycerol by ether linkages. Archaea cell walls have no peptidoglycans, polymers made up of sugars and amino acids that form a webbed layer outside the cell walls of most bacteria. While archaea do not respond to some antibiotics that bacteria react to, they do react to some antibiotics that distress eukaryotes. Archaea contain ribosomal ribonucleic acid (rRNA) specific to the archaea, essential for protein synthesis, identified by molecular areas noticeably unlike that of the rRNA found in bacteria and eukarya. The main classifications of archaea include crenarchaeota, euryarchaeota and korarchaeota, as well as the proposed subdivisions of nanoarchaeota and the proposed thaumarchaeota. Individual classifications indicate the types of environments in which researchers and scientists find these single celled organisms. Crenarchaeota live in environments of extreme acidity and temperature, and oxidize ammonia; euryarchaeota include organisms that oxidize methane and love salt in deep-sea environments, other euryarchaeota that produce methane as a waste product and korarchaeota, a category of archaea that also live in high-temperature environments. Nanoarchaeota differ from other archaea in that they live atop another archaean organism called Ignicoccus. Subtypes of korarchaeota and nanoarchaeota include methanogens, organisms that produce methane gas as a by-product of the digestive or energy-making processes; halophiles or salt-loving archaea; thermophiles, organisms that thrive in extremely high temperatures; and psychrophiles, archaea organisms that live in extremely cold temps. Bacteria live and thrive everywhere on the planet: atop mountains, at the bottom of the world's deepest oceans, inside the digestive tracts of both humans and animals, and even in the frozen rocks and ice of the North and South poles. Bacteria can spread far and wide over years because they can go dormant for prolonged periods. Bacteria exist as the leading living creatures on the planet, having been here for at least three-quarters of the planet's evolving history. They are known for their ability to adapt to most of the habitats on the planet. 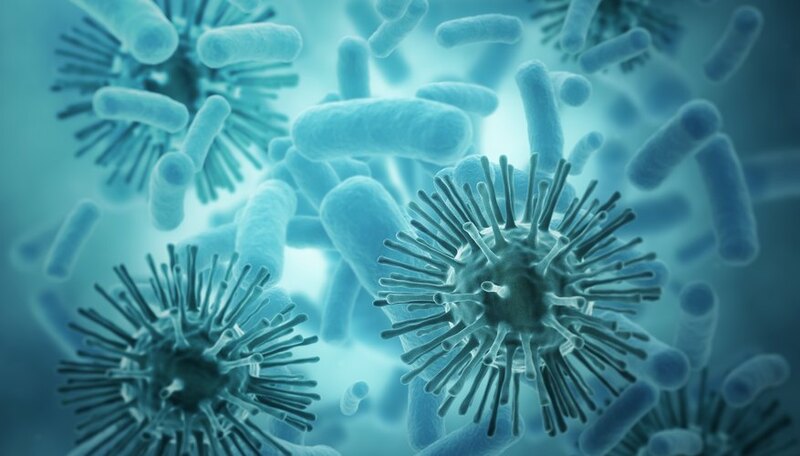 While some bacteria cause virulent diseases in animals, plants and humans, most bacteria work as "beneficial" agents of the environment with metabolic processes that sustain higher life forms. Like archaea, scientists define bacteria as prokaryotic cells, without a defined or separate nucleus. Membranes consist of unbranched fatty-acid chains connected to glycerol by ester linkages like eukarya. Bacteria cellular walls contain peptidoglycan. Traditional antibacterial antibiotics affect bacteria, but they resist antibiotics that affect eukarya. Have rRNA specific to bacteria because of the presence of molecular regions different from the rRNA found in archaea and eukarya. Scientists classify most bacteria into three groups, based on how they respond to oxygen in gas form. Aerobic bacteria thrive in oxygen environments and require oxygen to live. Anaerobic bacteria don't like gaseous oxygen; an example of these bacteria would be those living in sediments deep underwater or those causing bacterial-based food poisoning. Lastly, facultative anaerobes are bacteria that prefer the presence of oxygen in their growing environments but can live without it. But researchers also classify bacteria by the way they obtain energy: as heterotrophs and autotrophs. Autotrophs, like plants fueled by light energy (called photoautotrophic), make their own food source by fixing carbon dioxide, or by chemoautotrophic means, using nitrogen, sulfur or other element oxidation processes. Heterotrophs take their energy from the environment by breaking down organic compounds, like saprobic bacteria living in decaying matter, as well as bacteria that rely on fermentation or respiration for energy. Another way scientists group bacteria is by their shapes: spherical, rod-shaped and spiral. Other shapes of bacteria include filamentous, sheathed, square, stalked, star-shaped, spindle-shaped, lobed, trichome-forming (hair-forming) and pleomorphic bacteria with the ability to change its shape or size based on the environment. Further classifications include mycoplasmas, disease-causing bacteria affected by antibiotics because they lack a cell wall; cyanobacteria, photoautotrophic bacteria like blue-green algae; gram-positive bacteria, which emit purple in the gram-stain test because the test colors their thick cell walls; and gram-negative bacteria that turn pink in the gram stain test due to their thin, but strong outer walls. Gram-positive bacteria respond better to antibiotics than do gram-negative bacteria because while the former's wall is thick, it is penetrable, whereas in gram-negative bacteria, its cellular walls are thin, but act more like a bulletproof vest. Eukaryotes have a distinctive, separate nucleus protected by a membrane. Membranes, like that of bacteria, consist of unbranched fatty acid chains connected to glycerol by ester linkages (which makes cell walls more sensitive to the external environment as compared with archaea). Cellular walls – in eukaryotes that have them – do not contain any peptidoglycan. Antibacterial antibiotics generally do not affect eukaryote cells, but they do react or respond to antibiotics that typically affect eukaryotic cells. Eukaryotic cells have a molecular region with rRNA different from the rRNA that exist in archaea and bacteria. The eukaryotic domain contains four kingdoms or subcategories: protists, fungi, plants and animals. Of these, protists contain only single celled organisms while the fungi kingdom contains both. The Protista kingdom includes living organisms like algae, euglenoids, protozoans and slime molds. The fungi kingdom includes both single cell and multicellular organisms. Single cell organisms in the fungi kingdom include yeasts and chytrids, or fossilized fungi. Most organisms within the plant and animal kingdoms are multicellular. Although most single cell entities on the planet usually require a microscope, you can observe aquatic alga, Caulerpa taxifolia, with the naked eye. Defined as a type of seaweed native to the Indian Ocean and Hawaii, this killer algae is an invasive species elsewhere. This living organism in the plant kingdom can grow from 6 to 12 inches long and has feather-like flattened branches, which arise from a runner, in dark to light green hues. Perched in the hills above the University of California Berkeley campus sits the Lawrence Berkeley National Laboratory, jointly managed by the U.S. Department of Energy and the University of California system. An international team of scientists, led by the Berkeley Lab's researchers, discovered in 2015 what might be the smallest single celled organism captured in an image taken from a high-powered microscope. This single celled organism, a prokaryotic bacterium, is so small that 150,000 of these singled celled bacteria could sit on the tip of a hair from your head. The researchers continue to study these believed-to-be common organisms, as they lack many of the features necessary to function with other organisms. The cells appear to have DNA, a small number of ribosomes and thread-like appendages, but more than likely rely on other bacteria to live. Scientists at the Charles University in Prague discovered the only known eukaryote organism that does not contain a specific kind of mitochondria, and they found it in the gut of a pet chinchilla. As the cell's powerhouse, mitochondria do several things. In the presence of oxygen, mitochondria can charge up molecules and manufacture critical proteins. But this organism, a relative of the giardia bacteria, uses a system like those typically found in bacteria – lateral gene transfer – to synthesize proteins. As bacteria exist primarily as prokaryotic cells, finding a bacteria-related eukaryotic cell is an exception to the rule. Brenner, Laurie. "List of Single-Cell Organisms." Sciencing, https://sciencing.com/list-singlecell-organisms-8543654.html. 09 August 2018.